I was six years old when it happened, and until recently I thought perhaps my memory had confused old dreams with real events. But poking around the internet finally paid off. An Army plane really did crash just outside of Solvay. It was returning to the airstrip in Amboy, about two miles northwest of the village. The airstrip was part of what was then the Syracuse airport; during World War II it was also part of the Syracuse Army air base. It was Sunday night, July 2, 1944; my parents and I were watching a movie at Craig's (aka the Community) Theater on Milton Avenue. My one-year-old sister, Mary Beth, was at home with my grandmother, who lived next door to us. Suddenly we heard the roar of engines as a plane flew overhead. I'd never heard that sound while inside the movie theater, which meant the plane must have been flying very low. Seconds later the theater went dark and then someone summoned us outside. There was nothing to see, but someone who had been outside the theater said the low-flying plane appeared to have struck the top of the tallest building in the village, a 19-story structure that was part of the sprawling Solvay Process Company complex across the street. There is no mention in the stories below, but I believe the plane did hit either a flagpole or an antenna on a tower atop that Solvay Process building before it crashed in a field well short of the airstrip. As years went by, my mind somehow linked this incident with one that occurred in 1945 when a B-25 bomber hit the Empire State Building between the 79th and 80th floors, and killed 14 people. And while the stories below indicate otherwise, security was nonexistent a couple of days later when my uncle Bill Smolinski took my cousins and I to the crash site and we freely walked around looking for pieces of the plane. We actually walked off with at least one. It's another of a zillion or so examples of how the world has changed in the past 65 years. Today a military or civilian police official would have prevented people from even parking their vehicles near the scene. • 2nd. Lt. William Miller, 19, son of Hyman Miller, Bayonne, New Jersey. • 2nd. Lt. Theodore E. Armstrong, 19, son of Eldridge E. Armstrong, Elbert, Texas. • 2nd. Lt. Seymour M. Kirschenbaum, 20, son of Maurice M. Kirschenbaum, Chicago Illinois. The bodies of the airmen, held over night at the county morgue, were sent to their homes today. The plane, similar to those seen in the air over Syracuse day and night, apparently developed trouble while flying on a routine training mission out of the Army Field and headed downward. It missed a large section of high tension wires that run across Belle Isle Road and struck a single strand wire carrying 425 volts. After striking the wire it crashed into a small field on the Naples farm at Belle Isle and State Fair Roads. It struck with terrific force and disintegrated. The tail section was broken clear of the fuselage, the motors tore loose from their mounts in the wings and the propellers tore free of the engine shafts. Two of the pilots were thrown clear of the wreckage as it bounced across the field, while the other was thrown to the ground, still strapped to his seat, beneath the left wing. Officers at Syracuse Army Air Base were unable to say which of the three was at the controls at the time of the crash as the pilots alternate while on training flights. The plane burst into flame as the gasoline tanks broke open. None of the crew members, however, was burned. Frank Napoli, of Gere's Lock, and a man whose identity was not learned, witnessed the crash and rushed to the wreckage. They pulled the body from beneath the wing. An Army board of inquiry, composed of a group of officers at Syracuse Army Air Base, went to the scene of the crash this morning and examined the wreckage in an effort to determine the cause. From eyewitnesses, it is believed one of the engines developed trouble and caused the ship to do down. "The plane lost altitude rapidly as the smoke increased in volume," Pendergast said. "It didn't plunge vertically. When it disappeared below my horizon I knew it was crashing and listened, but didn't hear anything. "Next I saw a red flash, followed by an increasing red glow. Just a second before this, the electric light power at the airport went off. The airport switched on its diesel motored power plant and the lights went on again." The crash attracted hundreds to the scene and as the wreckage lay blazing on the ground, other cargo planes roared overhead on their training flights. Napoli told Sheriff Robert Wasmer he heard a noise "like a ripping clap of thunder, and my wife ran to the window and saw the fire." Napoli lives about 200 yards from the scene of the crash. Continuing, he said, "I ran toward the plane and with another man I didn't know and tried to find the fliers." "We saw one of them under a wing. We ran up, shielding our faces against the flames, and pulled him up a bank and among some trees in front of the lock. We thought he was alive." Frank Gilanti of 2851 Milton Avenue, another witness to the crash, telephoned the sheriff's office at 9:12 P.M. and reported the accident. Sheriff Wasmer with Deputies Justin King, Charles Post, Walter Foote, Leo Beebe, Edward West, Raymond Saaler, Raymond Dear, Robert Kanasola and Jailer Clifford Black sped to the scene. A call was put through to the Rev. Carl Denti, assistant pastor of St. Cecelia's Church, Solvay, and he went to the field and administered last rites over the bodies of the three. Solvay police and Fairmount auxiliary policemen assisted deputies in keeping the crowds of curious back from the live wire that was snapping and crackling on the ground. This danger was cleared after emergency crews from the lighting company made repairs. The Air Base was informed of the tragedy and within a few minutes Base intelligence officers and military police arrived and cleared the field of all spectators. Solvay Fire Department sent one of its trucks to the field, but the intense heat from the blazing wreckage prevented them from getting close enough to extinguish the flames. Horace Mosher and Carmen Petrocci, whose addresses were not learned and who witnessed the crash, told Army officers the ship was traveling in a westerly direction and the right wing seemed to be dipped. The plane motors roared in a sudden burst of power, they said, indicating the pilot sought to gain altitude when the crash came. As the plane struck the wire, lights in Solvay dimmed momentarily. The accident happened about a mile west of Solvay. In 1944 there were several accidents in New York State involving military airplanes and pilots in training. Most of the crashes involved the C-47, considered one of the most reliable transport planes ever built. However, some of those used for training purposes were relatively old and well-worn. Many of the pilots were inexperienced, perhaps the same was true of the mechanics who serviced the planes. Bigger considerations, at least for those crashes that caught my eye, were the terrain and the Central New York weather, which is strongly influenced by Lake Ontario, notorious for its effect on winter storms. From November through April, Central New York often resembles the Arctic. Even during the rest of the year flying conditions are often poor, particularly over Lake Ontario and the Adirondack Mountains. The top half of New York State – the area north of the present-day Thruway – can be scarier than the Bermuda Triangle. Certainly this was true in 1944 for pilots on nighttime training flights. This is the most famous of the 1944 crashes and perhaps the most tragic because the plane got lost in a snowstorm and the pilot apparently tried for hours to find somewhere to land. The plane eventually went down in Lake Ontario and took the lives of its eight-man crew. 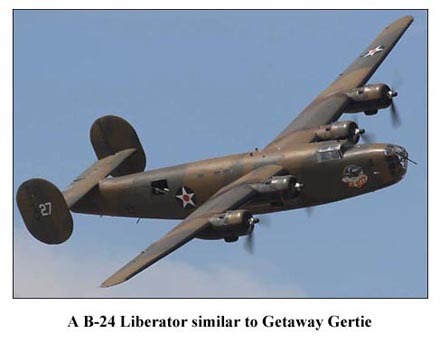 The plane was a B-24 Liberator and like other World War II bombers, this one had a name — Getaway Gertie (though some news reports referred to it as Gateway Gertie). It disappeared after the crew made contact with the Syracuse airport about 2:30 a.m. to report its fuel supply was low. The plane was on a training flight from Westover Field, Massachusetts, when it got lost in a snowstorm. The crew had been ordered from Westover to abandon ship, but apparently decided to remain in the plane and keep looking for a safe landing spot. The plane's destination was Syracuse, and while some residents there reported hearing a plane overhead shortly after midnight, the plane headed northwest and was heard over Oswego about 1 a.m. Then it circled to the east and was heard at Galloo Island by a Coast Guardsman who felt the plane was headed in the direction of Henderson Harbor, about 60 miles north of Syracuse. A Henderson Harbor resident told state troopers she heard a plane over her home between 2 and 3 a.m. However, it sounded to her as though the plane was flying toward Lake Ontario, which, if true, meant the plane had circled around again. The times reported by the various people didn't quite add up, though if one were to allow that most folks don't take notes of such things, it's possible the plane did pass within radio range of Syracuse at 2:30 and then veered northwest, toward Henderson Harbor and the lake. The plane might have been attempting to circle the Syracuse airport in Amboy, waiting for the storm to pass and visibility to improve, and was blown off course. There was all kinds of speculation afterward. Some thought the plane had come down east of Syracuse, in the foothills of the Adirondack Mountains. A justice of the peace in the village of Denmark, about 20 miles east of Henderson Harbor, reported hearing a crash about 4 a.m., and later that morning the search for the Liberator was concentrated in a wooded area near Denmark in a place known as Tug Hill. However, none of the planes sent to survey the Tug Hill area spotted any wreckage. Meanwhile, the Coast Guard was alerted to the possibility Getaway Gertie crashed in Lake Ontario. If so, the plane would have disappeared without a trace. A ground and air search continued for several days over a large area. Planes flew over Lake Ontario as far west as Rochester looking for a single piece of wreckage, a parachute or anything else that might be a clue to the whereabouts of the Liberator. Meanwhile, several planes continued to fly over the Tug Hill area while rescue workers on the ground struggled for hours through snowdrifts, looking for the plane. Snow in some areas of the search was four-feet deep. Even so, the search was extended as far north as St. Lawrence County and as far east as the Catamount mountain section near Lake Placid. Meanwhile, other people came forward to report what they heard that night. More and more it seemed likely the plane wound up in the lake. Then, on February 24, a resident of Scriba, a village near Oswego, took a walk along the lake shore and spotted something in the water, about 1,000 feet away. He notified authorities, thinking it might be from the B-24. Coast Guardsmen from the Oswego station were dispatched. Turned out the object in the water was the 35-foot-long left wing of the plane. The big question became how long the wing had been afloat. If it was torn off in the crash, it would have drifted several days and many miles before it was found. But some investigators said if that were the case the wing would have been spotted days earlier by pilots who had been patrolling the lake. If the wing had broken loose only hours before it was spotted, that would mean the rest of the plane was nearby. The wing stayed or rose to the surface because of the boyance of its empty fuel tanks. In any case, the floating wing did not lead to the discovery of the rest of the plane. Other pieces may have broken away and wound up on shore, but the bodies of Getaway Gertie and its crew have never been found. Flight Officer Wendell K. Ponder of Jackson, Mississippi. Flight Officer Raymond A. Bickel of Springfield, Massachusetts. Sgt. Audrey H. Alexander of Rogersville, Alabama. Sgt. Kenneth M. Jones of Milwaukee, Wisconsin. Sgt. Thomas C. Roberts of Boston, Massachusetts. Sgt. Joseph M. Zebo of Pawtucket, Rhode Island. Corp. James O. Cozier of Tulsa, Oklahoma. Philip R. Walton of Berkeley, California. To me, this is the most interesting, for several reasons, starting with the fact it occurred about a mile from my family's favorite vacation destination, Sandy Pond. A C-47 transport went into Lake Ontario near Montario Point about 2 p.m. The two-man crew, Lt. Frederick Frenger, pilot, and Lt. Curtis L. Aultman, co-pilot, were rescued, thanks to area residents, led by Mr. and Mrs. Elwin Kast, who were painting their barn a few miles away when they heard the plane's engines. A few seconds later, when the plane hit the water, the Kasts, who couldn't see the plane, mistook the sound for an explosion. The Kasts immediately phoned the marina at nearby Greene Point on Sandy Pond. An inboard speedboat belonging to Gilbert Whipple of Endicott was gassed up and ready to go when Mr. and Mrs. Kast arrived. The couple got into the boat with three others, Mrs. Robert Sawyer, Miss Clairene Greene and Miss Faith Sawyer. Whipple remained at Greene Point after giving Miss Sawyer a short lesson on how to start the motor. She then drove the boat through the Sandy Pond channel and out into Lake Ontario to search for the plane. There was a heavy mist hanging over the lake. The rescue party later told a weekly local newspaper, The Sandy Creek News, that they spotted what appeared to be two ducks, who turned out to be the pilot and co-pilot trying to swim toward land. In fact they were swimming parallel to a beach they couldn't see. In any event, the rescue party assisted the two men into the boat and took them to Greene Point where Mrs. Faith Greene and neighbors had blankets and hot coffee waiting. A local doctor, H. L. Hollis, had already been contacted, as had the Syracuse Airbase about 60 miles away. An ambulance was sent from the airbase, arriving about 90 minutes later. According to Frenger and Aultman, they were flying one of the oldest planes at the air base on what was supposed to be a routine low altitude training flight when one of the engines began throwing oil. "The right engine cut out — that's all I remember," explained Lt. Frenger. With Lt. Aultman at the controls, the men fought to gain altitude with only one engine, but found it impossible. Lt. Frenger, 25, was uninjured, Lt. Aultman, 22, suffered a cut on his scalp. Storms in this area are often brutal, making the lake angry and very rough. It is thought the lake wasted little time tearing the C-47 apart. 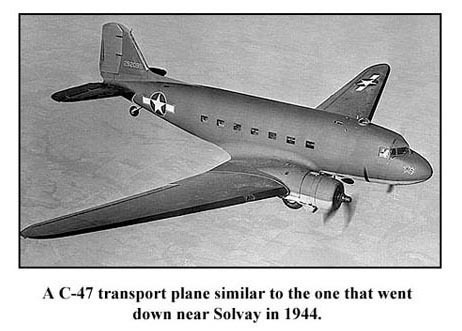 Pieces of the plane soon showed up on the long stretch of beach on the Sandy Pond peninsula, both north and south of the channel, but as far as I know, most of the C-47 was never found. The victims were 2nd Lieut. Robert Allen Baiser, 20, of Delphi, Indiana; 2nd Lieut. Gene Norman Meyer, 20, of Dayton, Ohio, and 2nd Lieut. George William Kelley, 24, of Rochester, New York. There was no one else aboard. The plane came down about 10:30 p.m. and exploded upon impact about 1,000 feet from shore. This marked the third time in three weeks that a C-47 flying out of the Syracuse Army Air Base had crashed. Oneida is a shallow lake. This plane was located early the next day in five to 10 feet of water. A doctor, who happened to be passing nearby, stopped and treated a crew member whose arm was cut. The only fatality mentioned in newspapers was a Guernsey cow that was standing in a field when it was struck by the plane and torn to pieces by a propeller. However, newspapers also said the plane had plowed through two chicken houses before it hit the cow. Aboard the plane were 2nd Lt. Willis Arneberg, Flight Officer Harold L. Graybill; Sgt. B. Kielpopof, whose arm was cut; Pvt. Paul Spielberger and Pvt. William Rosenblum. The plane had just taken off from the Cortland airport when it encountered problems. Witnesses on the ground reported seeing a puff of smoke just before the plane nosed downward in a gradual glide. The pilot apparently aimed for the farm field and he and his crew were able to escape the plane before it burst into flame. The Syracuse Air Base has started using the Cortland airport for training purposes the previous week. That same weekend five army fliers were killed when their four-engined bomber crashed on a farm in Blockville in Chautauqua County in western New York, near Jamestown. They were flying out of Topeka, Kansas. Seven crew members survived, though three were seriously injured. Two officers suffered minor injuries on Saturday when their twin-engined Army bomber crashed while trying to take off at the Army airfield in Rome, about 50 miles east of Syracuse.